I don’t know about you, but to me, nothing screams “THE HOLIDAYS!” more than a good plaid, buffalo check or flannel piece. 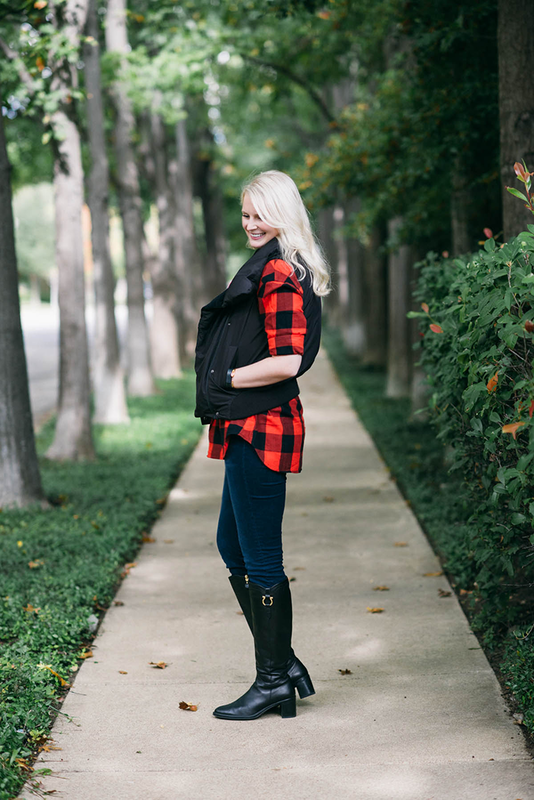 As soon as the temps drop, I’m always drawn to cozy, festive pieces to wear by the fire, like this buffalo check shirt! It’s one of my favorite things to do at home during the holidays – snuggle up with a mug of cider (or glass of wine) and just hang out with my family. Not to brag, but my stepdad makes a mean fire! It’s definitely a focal point at our house and the center of all social activity when our family gets together. 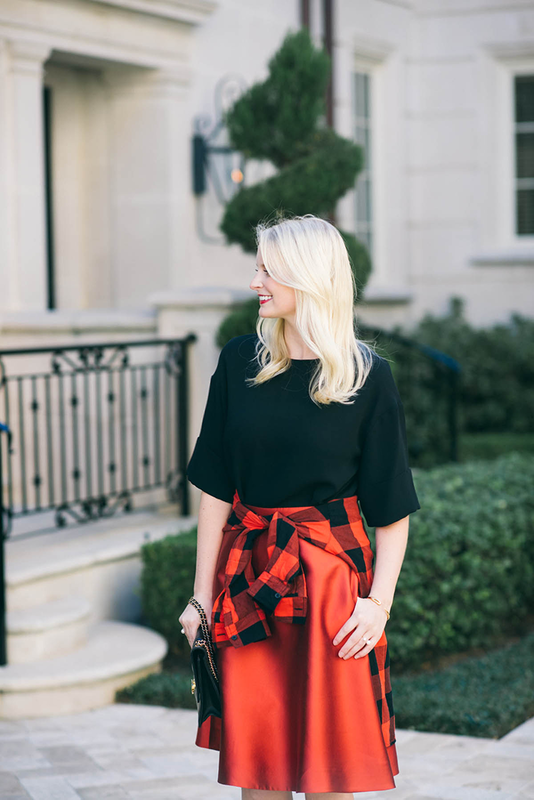 Whether you’re dressing down for an easy weekend at the ranch or need something festive to dress up your holiday party outfit, a plaid shirt is a winter staple that everyone should own. I love this one because of the festive pop of red and the relaxed boyfriend fit. This is the first time I’ve styled the shirt-tied-around-the-waist look, but I’ve got to say I’m a fan. It cinches in your waist with absolutely no effort. Yes, puh-lease. PLUS, it’s a fun way to layer and add a bit of depth to your look, don’t you think? Which look is your favorite? Shop more amazing plaid looks over at OldNavy.com. 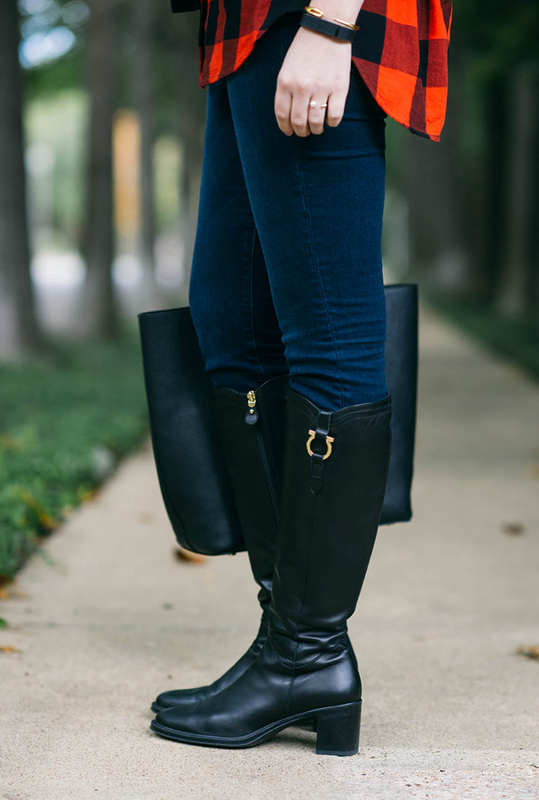 Love your tall boots and that J.Crew skirt. Love the second look. Beautiful skirt and heels! I saw your preview on instagram and I just love the black and red colors. You look beautiful in both of these looks! The way you dressed the shirt up and down is perfect! 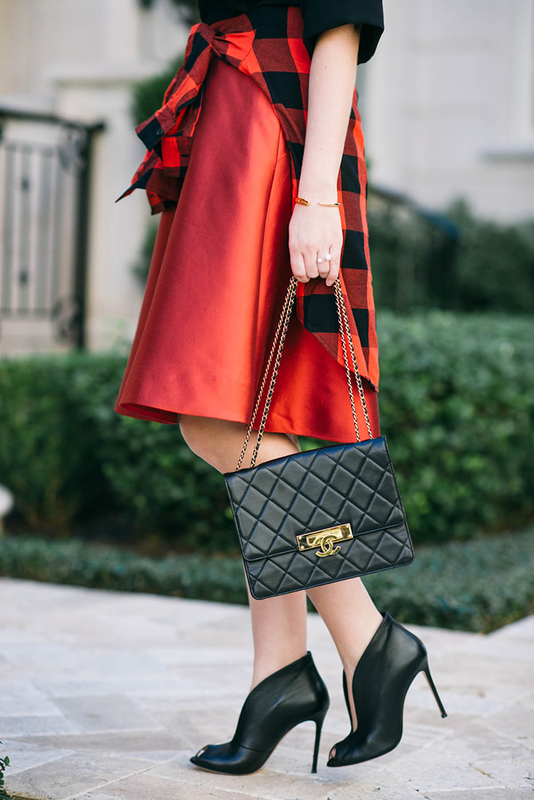 Love how you styled it over the red skirt, love!! I absolutely love what you’ve done with that shirt! Both looks are perfect. 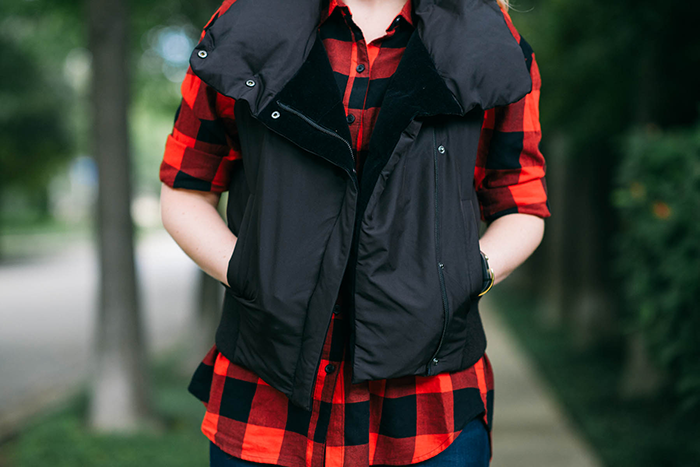 Love that Theory vest, BTW. You make ON look so chic, girl. They are lucky to collaborate with you. Old Navy has had some really great stuff this season! A good buffalo check is a closet necessity. I swear I have worn mine about 23 different ways. Love the casual look and that amazing red skirt in the second look! 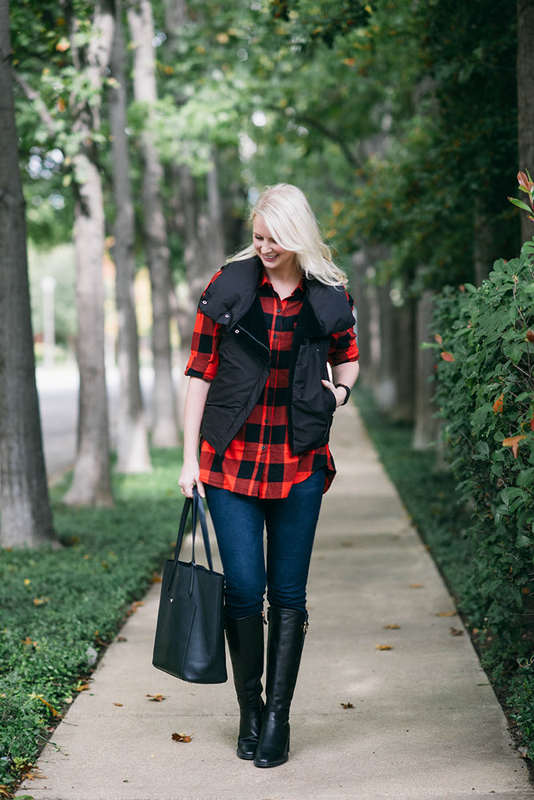 I can’t get enough plaid during the colder months and you styled this shirt perfectly. I’m obsessed with both of these looks. Stunning! Obsessed with both of these looks!!! I need to get myself over to Old Navy asap!! Such a perfect top! You look gorgeous! OMG I love how creative you were with the second look! Gorgeous!!!!!! I would never think a plaid shirt would look so good tied around the waist on a dressed up look! I love how you pair the plaid for two different looks. FAB! Great flannel! Could have really used it this past week for game day!! Loving how you styled both looks!!! Love this look – the second is so unexpected with the skirt, yet completely perfect! I’m really into this type of plaid right now. I really like it paired with that pretty red skirt too! Both looks are great! You always look so pretty too! I love your first outfit. It’s so edgy with the vest. I can’t wait to post my plaid ensemble. 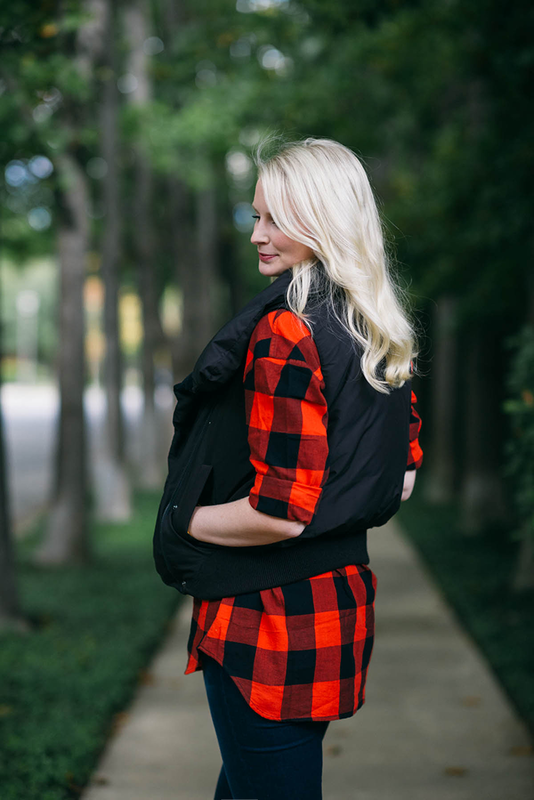 We love the ways you styled the plaid shirt! Especially in the second outfit! So unexpected and chic! 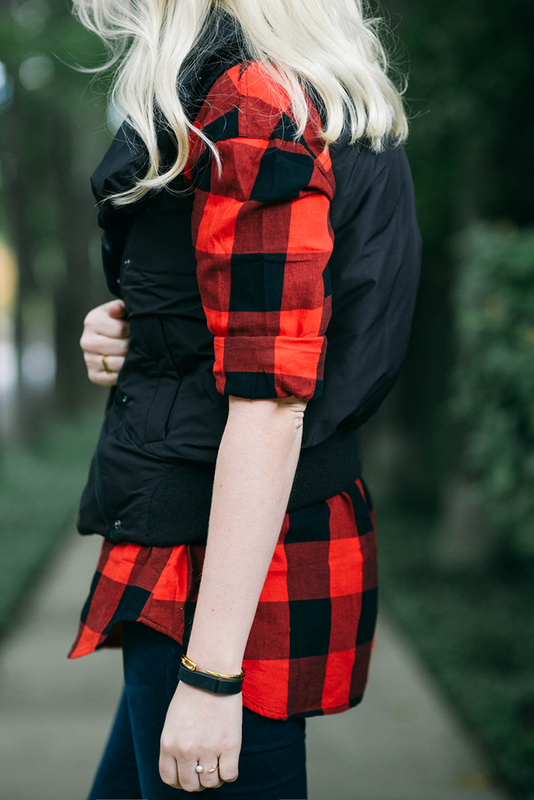 Seriously the perfect plaid shirt and I love how you styled it! Adore the shirt and both looks! Perfect for this time of year! Love both these looks! Definitely the perfect way to go from day to night easily! Great looks lady, I always say you look fantastic in red! Beautiful! Love that puffer vest. I’d wear both of these in a heartbeat! I love how you paired the skirt with the plaid – p.s. I wore a midi with plaid yesterday.. this has happened twice now, ha! I absolutely adore how you styled these! You look great in that sporty/ casual look.